SPORT & RECREATION Do You Bocce? 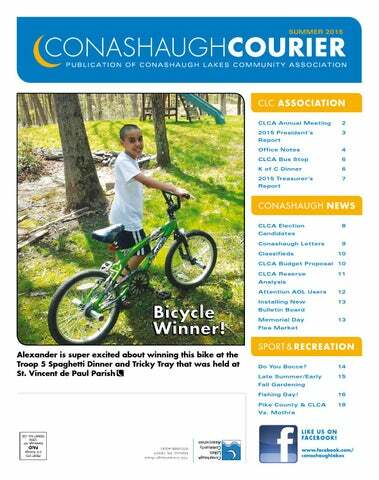 Welcome to the Annual/Summer Edition of the Conashaugh Lakes Courier. It is one of two Courier publications issued each year. In addition to general articles, this edition includes information regarding the proposed budget for 2015/2016 and Board Candidates. The Annual Meeting always takes place on the last Saturday of September which this year falls on September 26th. This year it will be held at the St. Vincent’s Parish Hall which is located just south of Conashaugh. Start time for the meeting is 9:00 a.m. Despite folk lore and tales of insanity past, the meetings of the last several years have gone smoothly albeit are lightly attended. Refreshments will be served. Approximately one month before the meeting all members are mailed a ballot. Owners are permitted one vote regardless of the number of people on a deed or properties owned by that party. For example if two people together own five properties, they are only eligible for one vote. If you do not receive a ballot in the mail by August 30th, Please contact the CLCA office. Votes can be cast by mail or in person. If you are returning your ballot by mail, it is important that you use the provided envelope addressed to our Accountants, Beck, Gogolski and Poska. Please do not include dues payments or other correspondence with your ballot. Do not mail or deliver your ballot to the CLCA Office. We cannot accept them. If you prefer to vote in person at the meeting you will be provided a ballot upon sign in. CLCA recognizes proxies for the Annual Meeting. A proxy is a written authorization empowering another person to vote or act for the signer. Included on your ballot is a section to assign a proxy. This gives members the opportunity to continue to vote beyond the initial mailed ballot. If additional voting is necessary at the meeting and you are not present or have not assigned a proxy your voting power ends after your initial, mailed in vote. An example of where additional voting would be required is in the event of a failed or tied budget vote. If you assign a proxy on your ballot, it is important to be familiar with that person’s position and visa-versa regarding candidates and the budget. The proxy assigned by you is not informed by us as to how you voted on your mailed in ballot and, without knowing your position will likely use your proxy to vote their own conscience. Please note that mail-in deadlines and eligibility to vote are strictly followed. If you have any questions regarding ballots, proxies or the Annual Meeting, please do not hesitate to contact the CLCA Office. Niki Jones Agency, Inc. 39 Front Street, Port Jervis, NY 12771 P: 845.856.1266 E: publisher@nikijones.com Disclaimer: The comments, statements or written opinions expressed in Conashaugh Courier are the sole responsibility of the signed individual/author and/or committee and are not edited. All letters to the editor and paid advertisements do not reflect the opinions or views of the Conashaugh Lakes Property Owners Association. Conashaugh Courier is not responsible for typographical errors, mistakes or misprints. All advertising, including photographs are the property of Niki Jones Agency, Inc and not that of the advertiser. The advertiser has purchased rights of reproduction in Conashaugh Courier and does not have the right to reproduce ads in any other place or publication without written permission from the publisher. Conashaugh Courier reserves the rights to exercise its discretion in the selection of advertisement. To all CLCA members: Among the many lessons I’ve learned in more than fifty some years in a variety of endeavors is the value of a trusted advocate. As President of the CLCA board of Directors, I can assure you that the members of the Board are strong advocates for the interests of our Community Members. We work hard to represent your interest by working with Office staff to see that everything done is for the benefit of all members, both young and old. The Board of Directors and the staff in the Office are always concerned that all we do is for your benefit and no one else’s. This year we have again accomplished road paving with one dirt road paved and several others updated to maintain their condition as they age. We intend to pave another dirt road next year. Maintaining the roads that are already paved are a priority. This year we were able to pave more length of road using a tar and chip application. This method is less expensive than traditional paving and allows for the life of a road to be extended. It won’t allow the time between re-paving to be as long as the previous methods. It should help in allowing us to pave all or a portion of a dirt road each year. Paving all or a portion of a dirt road is my goal. Many ask how it is decided which dirt road will be paved. Several factors go into deciding this such as the number of developed properties on a road, length of the road, traffic use for the road, cost to maintain the unpaved road and last but not least money available to do the paving. Also this year we were able to replace the Grader that was purchased in 1970 at a cost of $42,000. At a 3% inflation rate over the years the cost to replace it would have been $98,700.00. We were able to purchase a newer, used grader for $ 45,825 while receiving $22,000 for our trade in. Late this year the Ford F350 reached the end of its life and we have replaced it with a used Chevrolet Silverado. The F350 was purchased in 2006 at a cost of $68,000 w/plow. We received $4,000 trade in against the cost of a “Fleet Lease” return vehicle for $49,000. All of the above purchases were accomplished using Reserve Money. Reserves accounts are funded by allocating money every year in the budget for “Reserves” There are two Reserve Accounts. One is for Roads and the other is General Reserves. CLIP & SAVE United American Security Phone Numbers Guard House at Front Entrance 570-686-1130 Guard on Duty at CLCA 800-682-4722 When paging please advise the operator that you are calling to have the officer on duty located and provide the location where the officer is needed (i.e., your home, compactor or other location). Always call 911 in an emergency! CAREER in Real Estate... ✔ One-on-one classes ✔ Webinars ✔ Seminars ✔ Never a charge or fee ✔ Learn to do rentals & sales ✔ Be your own boss Now is the time! Take courses on-line – ask us how. Ask for our FREE Recruit Packet. Learn more. Summer did not delay her arrival this year. She gave spring the old heave ho with temperatures in May jumping from freezing to the 80’s. Welcome to NEPA. Despite an early drought watch for our area we had a very wet June and first couple of weeks in July. Even with the rain work was accomplished. Roads were repaired and paved much earlier than in years past. Generally extensive road work took place in late August into September, but the Board of Directors wanted to get a jump on the work and take advantage of summer weather to allow leveling courses to cure before tar and chip was applied. Much has happened since the last issue of the Courier. Some of which you can read below. Mailbox Area In January the mailbox area sign was illuminated. It previously did not have an on/off switch and required manually pulling a plug each night. A timer was purchased and installed for illuminating the sign. The timer has a photocell allowing the sign to illuminate at dusk and remain on for six hours. The Maintenance department completed construction and installation of a bulletin board as well as extending the ground area surrounding that and the recycle bins. Saturday August 22nd. Thank you to chairpersons Michael Bulger and Lynn McCauley who along with a number of other members in the Community worked hard planning and preparing for this event. Last but certainly not least, thank you to our Board Members for their work! Tax Sales For the May Judicial Sale there were a total of seven properties in Conashaugh listed for tax sale. Not surprising but all of these lots also have delinquent dues. Currently there are eleven CLCA properties in Repository. For information regarding tax sales in Pike County go to http:// www.pikepa.org/tax.html. Trash and Recycling There has been a sharp decline in folks leaving garbage on the ground at the compactor along with no reported incidents of folks using the recycling bins as their personal dumpsters for several months now. Some other good trash related news is that the Board approved continuing the second pick up of recycling beyond Labor Day. Recycling does have an impact on the costs for trash removal. We ask all of our members to please recycle. New signs were installed on the compactor doors which should be very clear about what not to put in the compactor and the consequences for leaving trash. Dumpster day was held May 2nd. Four dumpsters used, three were for general trash, one was for metal. Delivery cost 3 dumpsters was 225.00 each. Cost per ton for contents 75.00. Fall 2015 Dumpster Day is scheduled to take place Saturday, October 17th. A total of 11.13 tons of trash was collected (excluding metal) during Spring 2015 Dumpster Day. CLCASSOCIATION Welcome to Conashaugh Lakes! A Happy welcome to the Hofmann family who arrived to our Community in June. Daniel and Jacqueline along with their children Daniel Jr., Alyssa, Alexa and Eliana are from North Massapequa, New York and will be living here full time. outside the bus lot. It is not safe for children or adults to be crossing exit or entrance lanes of the main entrance. buses will park in the travel lane located directly behind the front Conashaugh sign instead of the bus depot to discharge students. Vehicles are not permitted to move/leave the lot while these buses are present. If you arrive after the buses have entered the lot you are permitted to park in the bus depot area. Do not wait in or troll the aisles and do not pull up behind buses. Vehicles that have arrived late/parked in the bus depot will likely be the last to leave the lot. Plan accordingly. The first days of school are exciting for parents and kids alike and there typically are more cars than normal during those days especially for the Elementary/Primary buses. There will likely be a number of folks new to the bus stop experience. Please be kind and understanding to others and if you see someone who appears to be confused or unfamiliar with procedures, give them a hand. For your information, the phone number for the director of Transportation for DVSD is 570-296-1883. K of C Council 12571 First Sundays Dinner The Knights of Columbus Council 12571 have been serving dinner on the first Sunday of each month since September of 2014 at St. John Neumann Parish Hall. Those who are experiencing financial difficulties or are in need of socialization are invited free of charge to dinner served between 2:00-4:00. Members of the Knights cook and serve the meal restaurant-style to those attending. A full course menu and dessert are provided. The menus vary each month such as roast beef, turkey, ham, Italian and Spanish. All are welcome. Anyone planning to attend is asked to call the parish office Mon., Thurs, Fri. 775-0681 or Bob D’Elia at 7759826 on Tuesday and Wednesday. As mentioned in my President’s Report we have accomplished much this year by using monies that have been set aside over the years in our “Reserve” funds. In addition, some funds were used from our Capital Improvement Account to transform our latest road from unpaved to paved. CLCA uses funds from a number of accounts to accomplish everything from major purchases to day to day operations. Those accounts include Operating Accounts, General Reserves, Road Reserves and Capital Improvement. We are fortunate to have Reserves Accounts as there are a number of associations that do not have any or only a small amount in “Reserve”. This I discovered as a member of “AOCA”. 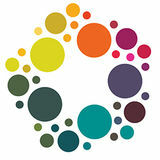 AOCA is an acronym for “Alliance of Community Associations. The Alliance was started several years ago by our past President John Crerand. The purpose of this group is to share knowledge of various laws and techniques for accomplishing various tasks associated with being a community. Over the years much has been learned by presentations given by various invited speakers. We also share experiences as Community leaders. It is a place where we do our best to help each other with current issues as well as hurdles that may lay in the future. Last Day of School Ice Cream Event! Thanks For Your Generosity Conashaugh has been the beneficiary of a number of generous donations of materials and useable objects in recent months. Thank you Robert Kurlyck for your donation of a nice outdoor table for the picnic area. Members Fidel and Reggie Iglesias donated a number of lounge chairs for the pool area and chairs for the office. Valerie Ferlauto and Jerry Collotti donated cabinets to our Maintenance Department for their shop and Elizabeth Herman and Anthony Mann donated several pallets of pavers. Thank you to all for your donations. Bill King In 2014, I “semi-retired” and moved full time to Conashaugh Lakes with my wife, Karen. We love the wild life and serenity of the community. I grew up on the tide waters of the Chesapeake Bay in southern Maryland’s farm country, fishing, crabbing, hunting and farming. As a teenager I spent summers working on a tobacco farm during the day while catching and selling crabs early in the morning. I worked my way through college as an auto parts clerk and graduated from the University of Maryland with a BS in Accounting. Shortly after college I joined Motorola where I spent the next 27 years. Leaving Motorola in 2006 I subsequently worked for two other companies based out of New York City, Brookwood Companies Incorporated and The New York Leadership Center, Inc.
Michael Bulger My name is Michael Bulger and I am running for the board. I have lived in Conashaugh for nine years and have served on the board as the community’s treasurer from my second year here through my seventh. I was required to take two years off after serving six, so now I’m running to go back on. As treasurer I tried to spend the community’s money as carefully as I would my own, holding any increases in dues to an average of about 1% a year while I was doing it. I was part of the subcommittee that created our roads fund which has been repaving roads the last few years, and I fought against putting us Michael Bulger into debt by spending seven figures to build a new pool/clubhouse that we didn’t need. Instead we spent less than a tenth of that to re-side our current pool and that should last literally for decades to come. I have also co-hosted our annual picnic in the past and am doing so again this year. Elect me and I promise to look out for the community in the same way I did for the six years that I was on the board previously. Thanks. Got Stuff? Please include a description of the item for sale along with the asking price and your contact information. You may also include a photo (jpg). Call the office at 570-686-4000 if you have any questions. D R U M L E S SONS Professional touring/recording drummer, now opening slots for new students. 40 years of experience – including over 25 years of instruction. Jazz, Rock, Concert band/Marching and Rudimental studies. Reasonable rates, my studio or your home. Call Mike 845-546-2024. References available. Don’t forget to send your CLCA (non-commercial) Classifieds to clcaloop@ptd.net . Attention AOL Users Who Are on the LOOP: We have been notified intermittently over the past couple of months by our provider Pen Tele Data that they received spam notifications from an AOL user on the LOOP. It is very important that AOL users are careful when deleting LOOP messages. The spam button is located next to the delete button for AOL and it is very easy to accidentally hit spam instead of delete. Unfortunately we are not informed as to who it is other than an AOL user when this happens. If we continue to receive warnings from our provider and AOL we could have our own account suspended. If you are an AOL user and no longer wish to receive messages from the LOOP, please contact the office and request removal from our mailing list. If our messages continue to be marked spam we may have no option other than to remove AOL users from our address book. Installing the New Bulletin Board! Are You Selling Your Property? Please be advised that Resale Documents are required for all property sales before the property closes. If you are an owner selling your property and have any questions on this subject, please contact the office. Attention Members With Dues Payment Plans Final payments for 2014/2015 payment plans are due by August 28th. Thank you to all of our members who paid their dues. The CLCA 2014/2015 fiscal year ends September 30 2015. Great news! Coming soon to Conashaugh at the picnic area will be our own Bocce court regulation size. I don’t have an exact date but I hope by our Annual Picnic. My name is Lenny Maruca and I will be the first Bocce Captain setting up teams. How this works is every Monday for ten weeks at 3:00 p.m. two teams (two people each) will play against each other. After that the best two teams will have playoff. There will be regulation Bocce balls that you will use. This is just an outline. Once we know how many teams we have, more information you will receive. Some Bocce Facts: Bocce Italian: A ball sport belonging to the boules sport family, closely related to bowls and pentaque, with a common ancestry from ancient games played in the Roman Empire. Developed into its present form in Italy. Bocce was initially played among Italian migrants but has slowly become more popular with their descendants and a wider community. Bocce is traditionally played on natural sil and asphalt courts 27.5 meters(90 ft.) in length and 2.5 to 4 meters( 8.2 to 13.1 ft.) wide. Bocce balls can be made of metal or various kinds of plastic. Unlike Lawn bowls, bocce balls are spherical and have no inbuilt bias. A game can be conducted between two players, or two teams of two, three or four. A match is started by a randomly chosen side being given the opportunity to throw a smaller ball, the jack (called a Boccino or Pallino in some areas), from one end of the court into a zone five meters(16 ft) in length ending 2.5 meters (8.2 ft.) from the far end of the court If the first team misses twice, the other team is awarded the opportunity to place the jack anywhere they choose within the prescribed zone. The side that first attempted to place the jack is given the opportunity to bowl first. Once the first bowl has taken place, the other side has the opportunity to bowl. From then on, the side which does not have the ball closest to the jack has a chance to bowl, up until one side or the other has used their four balls. The team with the closest ball to the jack is the only team that can score points in any frame. The scoring team receives one point for each of their balls that are closer to the jack than the closest ball of the other team. The length of a game varies by region but is typically 7 to 13 points. Players are permitted to throw the ball in the air using an underarm action. This is generally used to knock either the jack or another ball away to attain a more favorable position. Tactics can get quite complex when players have sufficient control over the ball to throw or roll it accurately. Anyone can play no matter what your age as long as you can hold the Bocce balls and understand the rules of the game. If you are interested in playing Bocce, please send me an email with the number of teams from your household. My email is lenjos@verizon.net. Please indicate “Bocce” in the subject of the email. OUTDOOR & RECREATION LATE SUMMER / EARLY FALL GARDENING Fall has distinct planting benefits. Pesky pests, especially mosquitoes, retreat due to cooler temperatures. You don’t need to fertilize since it promotes new growth that can be nipped in winter. This is the prime time to prepare your yard for the next growing season. September’s cooler air temperatures are easier on both plants and gardeners. Many perennials have a head start when planted in the autumn. It’s the perfect time to get outside and transplant trees and shrubs and divide some of those spring and summer blooming perennials. The soil still retains warmth from the summer’s heat encouraging root growth until the ground freezes which is often weeks or even months after the first frost hits. Frost might seem like your biggest fall planting challenge, but actually it’s not a huge problem. Yes, frost will kill the tops of your new plants but it won’t affect the root growth. few of your new perennials don’t make it, you’re probably still coming out ahead. There are so many reasons to get out and garden – take your pick. Your garden will love it! Happy Gardening from the Ladybug. Want free plants for your garden? Look for fat, plump seed pods. As they mature they swell up, stop growing and start turning brownish – that’s the key sign to look for in most cases. Collect seeds by shaking them inside a paper envelope. Some of the easiest perennial flowers to collect seeds from include: Black-eyed Susan, Cone flower, Meadow rue, Obedient plant, Perennial Sunflower, Perennial sweet pea, Veronica. Once you’re done collecting, write the name of the plant/ seed on the envelope and put it some place you won’t forget. A shoe box makes a fine file cabinet for all those envelopes. If collecting and storing seeds is not for you, the late summer is usually bargain time as garden centers are trying to sell the last of their inventory before winter. At the end of the season, you can find discounts on plants that have passed their peak. Most nurseries knock down prices when their perennials go out of bloom and lower them even more when the plants start looking down and out. Expect to find perennials at 50 percent or more off. You know that section in the bargain area that’s super cheap and it’s not hard to tell why. I call it death row, and it’s actually where I head first in the hopes of finding a steal. The plants often look pitiful, but some are still worth a shot. If it’s wilted, generally sad looking or has yellowing or dying foliage, but the right price, grab it, as long as there’s still some green and it’s not diseased. Bird Feeders! At the Conashaugh Lakes Recreation Center, BEAR Cub Scouts Alexander and Joseph achieving #24 Be A Leader, as they serve as a denner/assistant, plan and conduct a den activity with the donation of “build it yourself bird feeders”. It’s sad to report that there were a number of mischievous events that began when warm weather arrived. This activity includes but is not limited to decorations being removed from people’s properties, port o johns being flipped over, poop being thrown into the swimming pool. I could go on. Some will say it is out of boredom, others say it is a lack of respect and some may say it’s because “there’s nothing else for kids to do”. Some may think it is funny, others say disgusting. No matter what you call it, it is wrong and has consequences, perhaps not to the uncaught wrongdoer but certainly for their victims. Being on the receiving end of feedback for these events I can tell you that these acts have had impacts in a number of ways. That Angel stolen from someone’s lawn was in memory of a loved one and its removal devastated a young child, the squirrel removed from another property has been in that family for a very long time and can no longer be passed along, the flipped port -o- johns cost money to upright and that loser act of putting feces in the pool resulted in a lot of people not being able to enjoy a swim on what was probably one of the hottest days in the summer while preventing four people from going to work for the day. If you get a chance discuss these examples of how a “night of fun” can affect others and while you are at it, take the opportunity to share some warnings with your children about some real consequences. I am not talking about being carted away by the police. It could be meeting up with someone who will hurt or do worse to your darling. It would probably also be a good idea to really know who your kids are allowing into the Community because dear members, you are responsible for your guests and your child’s friend is your guest. Attention Seniors Each month the Pike County Area on Aging issues a newsletter. We share that newsletter via the LOOP. Printed copies are also available at the CLCA Office. Cub Scouts Receive Catholic Religious Emblem Our Cub Scouts Pack 1003, Dingmans Ferry, PA Receiving their Catholic Religious Emblem At St. Vincent de Pauls Parish. Not at all an easy task the boys and their parents worked for four hard winter months. Unlike the Mothra portrayed in films as a giant insect that lives on a tropical island and worshipped by local tribal people, the gypsy moth is no such diety. On the contrary gypsy moth caterpillars are despised. They destroy foliage on selected trees, especially varieties such as oak, birch, aspen and willow all of which are here in our Community. While trees may survive one or two years of such attacks, they generally do not survive beyond that. There were spotty reports of damage occurring in early spring in Conashaugh, but compared to some of our neighbors to the North, we were very fortunate. It is Pike County’s plan to have a spray suppression program in 2016. It is a request based program only. This means those wishing to be included must apply for this consideration. To qualify for the program properties must possess 250 egg masses per acre along with the trees favored by the moths. Special Olympics Winner! David and his parents enjoyed another weekend at Special Olympics in New Jersey. He won gold and silver in 25 and 50 meters. The Pike County Conservation District held a very informative seminar regarding these pests. Board Member/Environmental Liaison Bill King and I attended the seminar held at the Pike County Communications Center in August and learned about this caterpillar’s history, life cycle and procedures to be taken to be considered for the program. Our application was submitted immediately for the 2016 Program and was the first one received by PCCD following the seminar. The next step to take place will be an official count by PCCD of egg masses in our Community. They will also be determining spray blocks. All of these steps do not guarantee our participation in the program. First and foremost, the State needs to inform the County what if any funds will be allocated for the program and that has not been determined as of this writing. There are 17 counties including Pike that have applied for funds. Costs for spraying in 2015 ran between 26.00 and 27.00 per acre with cost sharing funds and 54.00 and 55.00 without cost sharing. It is expected these prices will increase for 2016. At this point we have done our part to get on board the moth suppression train and anxiously await further information regarding whether or not we qualify, if there is in fact going to be a suppression program and if so, how much it will cost the Community. Information regarding the product sprayed (BT) is available at the office. We will keep you posted on developments and moth news as we receive it. You can find helpful information on the Pike County Conservation District Website at http://www.pikeconservation. org/gypsymoth.htm. List and Sell your home with us! BUYERS! We have the largest inventory of homes in the Poconos. www.BHGwilkins.com Interested in a Career in Real Estate? Call us and ask how. The friendliest site in real estate featuring the friendliest search for real estate.